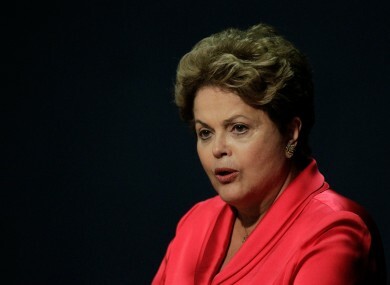 Dilma Rousseff has spoken to US President Barack Obama a number of times about the issue. BRAZILIAN PRESIDENT DILMA Rousseff postponed a long-planned state visit to Washington on Tuesday, the most serious diplomatic fall-out yet from Edward Snowden’s leak of US secrets. While both sides couched the cancellation in diplomatic terms, it marks an embarrassment for President Barack Obama and a blow to his efforts to improve ties with the key Latin American power. The visit had been scheduled for October 23 but was called into question after documents leaked by Snowden, a former US intelligence technician, revealed the extent of American spying on its Brazilian ally. Obama has been trying to defuse the row, most recently during talks with Rousseff on the sidelines of this month’s G20 summit, and he spoke with her again on Monday by telephone. But Brazil was unmoved, and on Tuesday Rousseff brought an end to the speculation, confirming that her trip was off. “The two presidents decided to postpone the state visit since the outcome of this visit should not be conditioned on an issue which for Brazil has not been satisfactorily resolved,” Rousseff’s office said. Her statement reflected Brazil’s anger over Snowden’s disclosures that the NSA spied on her email communications and on the state-run energy giant Petrobras. “The illegal interceptions of communications and data of citizens, companies and members of the Brazilian government represents a serious act which violates national sovereignty and is incompatible with democratic coexistence between friendly countries,” Rousseff’s statement said. In Washington, White House spokesman Jay Carney put a brave face on the situation. It’s because the relationship is so important and because it has so many facets that the president agrees with this decision they made together to postpone the visit. The spying row stems from allegations made by Snowden, a former NSA contractor who fled the United States and revealed the scope of the agency’s activities to Brazil-based journalist Glenn Greenwald. In July, the Brazilian daily Globo, citing documents provided by Snowden, who has been granted temporary asylum in Russia, reported that US agencies eavesdrop on Brazilians’ phone calls and Internet communications. The report said Washington maintained an intelligence base in Brasilia, part of a network of 16 such stations operated by the NSA around the world to intercept foreign satellite transmissions. Brazilian Communications Minister Paulo Bernardo dismissed claims by US officials that the NSA was only collecting metadata — logs of phone numbers called and the duration of such calls — and not listening in on calls. Brazil demanded an investigation and a US promise to stop such spying. Rousseff is to address the UN General Assembly session in New York later this month and her aides said she will raise the spying issue. Brazil is Latin America’s economic powerhouse and Obama made it a priority to improve ties, which were often prickly under Rousseff’s predecessor Luiz Inacio Lula da Silva. The canceled visit shows, however, how the Snowden row has damaged ties between the two trading giants – the United States is currently Brazil’s second biggest trading partner behind China. Email “Brazil president to postpone US state visit over NSA spy row ”. Feedback on “Brazil president to postpone US state visit over NSA spy row ”.